Today, most cedarwood oil doesn’t come from true cedar trees, but from juniper and cypress trees. Wherever it comes from, the woody smell of cedarwood oil is very popular. Thousands of metric tons of the stuff is produced every year and much of it – or it’s products – is used in perfumes and colognes, soaps and shampoos, lotions and creams. 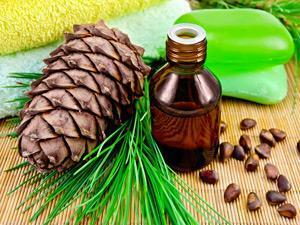 Like many other essential oil scents, the fragrance of cedarwood is due to a collection of chemicals. In Virginia and Texas cedarwood oil, one major odour chemical is cedrol. Cedrol itself is noted to have a light woody odour, being a fragrant terpenoid. Terpenoids consist of isoprene units, and, as it’s constructed of three isoprene units, cedrol falls in the sesquiterpene group. Fragrant sesquiterpenes, like those in cedarwood oil or sandalwood oil, are are often touted as being insect repellents. Cedrol might repel some insects, but it attracts mosquitos. And not just any mosquitos – pregnant mosquitos. Oddly enough, this is actually a good thing. Why? ‘Attract and kill’. ‘Attract and kill’ is a pest control strategy that requires an attracting agent and a killing agent. We need something to attract pests to a specific area and something to kill said pests once they’re in our trap zone. For mosquitos, if we can lower their population, we can also lower the incidences of mosquito-borne diseases like malaria. Malaria is caused by parasites of the genus Plasmodium, which infect mosquitos and the mosquitoes then infect us. People with malaria might feel like they’ve got the flu, with fever and chills. But if left untreated, it can result in death. According the US Centers for Disease Control and Prevention, there were an estimated 198 million cases of malaria worldwide in 2013 with 500,000 fatalities, mostly children in the African region. The attract and kill strategy can significantly diminish mosquito populations and halt this major route of malarial infection. According to the London School of Hygiene & Tropical medicine, controlling disease vectors – those pesky mosquitos – is the best way to combat malaria in sub-Saharan Africa. In the area of attract and kill pest control, an international research team focused on finding attracting agents for female mosquitos loaded down with eggs (so-called ‘gravid females’). Attracting pregnant mosquitoes for termination before they lay eggs expands the ability to control mosquito populations. After evaluating all sorts of soil and plant infused water combinations, researchers discovered a common chemical was particularly popular with pregnant mosquitos – cedrol. Research published in Malaria Journal in March, 2015 showed cedrol-treated water attracted twice as many gravid females as plain standing water, which is plenty tempting to mosquitos. In the field, researchers found that wild malaria vector females were three times more likely to be collected in cedrol baited traps than plain water traps. While other chemicals attract mosquitos, cedrol was reported as the first confirmed oviposition attractant for Anopheles gambiae, also known as the African malaria mosquito. Cedrol attracts pregnant mosquitos to specific egg laying sites, which could provide us a new means of controlling mosquito populations and minimizing the global impact of malaria. Cedrol’s attractive scent could serve a purpose beyond scenting our soaps and lotions. In helping us control the vectors of one of the biggest killers on the planet, cedrol could save lives. Raychelle Burks there, on how being attractive to hungry, pregnant mosquitoes can help to save lives. The French investigation into the failure of acrolein as a chemical warfare agent therefore had beneficial outcomes, not just for science and technology, but indeed for all of us. Join us for the story of acrolein next week. Until then, there are plenty more podcasts on our website, and you can get in touch with any more you’d like to hear at chemistryworld@rsc.org on on twitter, @chemistryworld. I’m Ben Valsler, thanks for listening. My place of working is India and i am working to attract the mosquito for the test purpose. I want to attract mosquito for my recherche work please suggest the best attractant .